"I don't think I need to tell you this, but my "investment" in your Life Coaching as a gift for my wife has been close to the best thing I have ever done with or for her, and ultimately for our relationship." Coaching is a powerful, ongoing relationship that helps you connect with your feelings and needs to realize your visions and goals. With a professional coach, you can get the tools and support to remove obstacles and facilitate change. Typically, individual coaching is done by telephone, for three 60 minute sessions each month. 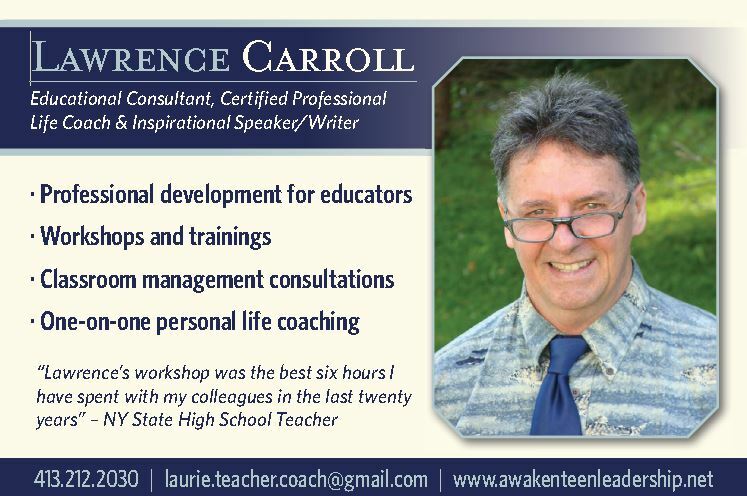 Lawrence offers a wide variety of services for individuals and businesses of all sizes including on-site coaching for educators and teen groups. To create dramatic changes in your life, Lawrence recommends a three-month commitment. No, coaching is not therapy. You will find that coaching focuses on personal and professional development and strategies for action, although many find it therapeutic. Coaches regularly refer clients to other professionals for particular issues where a therapeutic relationship is advisable. The hallmark of coaching is self-responsibility. The client sets the agenda for the call and the coach follows that agenda. You can expect deep listening, powerful questions, an environment for increasing self-awareness, focused planning tools, and empowering accountability structures. As your coach, I’ll have high expectations of you and support you thoroughly in creating a life you love.